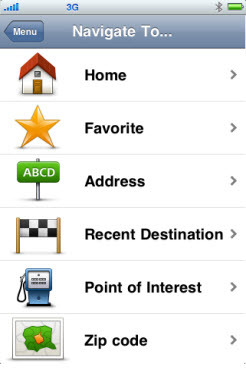 YW have been waiting quite some time for a real satnav app to become available for Apple’s iPhone. When the 3G version came on the scene about a year ago sporting GPS built in, our hopes were high, but we had to do with Google Map’s approximation: not real satellite navigation, more moving map showing current position and suggested route. This was fine until you either went into an area of poor mobile reception (good service needed to download the next map) or missed a turning as it would not recalculate the route. 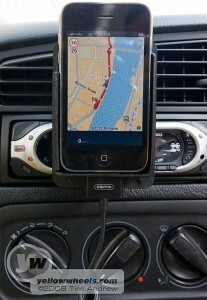 The much anticipated Tomtom satnav app for iPhone was released last week on 18th August. We downloaded version 1.0 immediately and installed it on a 1 year old 3G model running iPhone 3.0 OS (Operating System). we don’t have a 3Gs but decided that if it worked well on the older model, it should bode well for the newer machine and be compatible with a huge number of iPhones. We downloaded the UK and Ireland app at £59.99, very expensive for an iPhone app, but good value if you consider the cheapest satnav devices start around the £100-150 range. The app installed fine, and started up reasonably quickly. None of the current Yellowwheels fleet has satnav installed at manufacture. Why would you pay a premium of around £1000 when an aftermarket device is around £150? Manufacturers need to look very closely at the pricing of their OEM satnavs; most buyers are baulking at the price. Initial impressions were very favourable. A couple of days getting used to the system went well with a trip to Leicester, and then Wareham. But cross country routes are a cinch for satnavs, with only the odd direction down a muddy farm track to leave them with egg on their faces. We decided to hit London, with busy traffic and complex one way systems for a proper test. But first we ditched US Mandy’s voice for the dulcet tones of UK Jane (under SETTINGS>VOICE)! 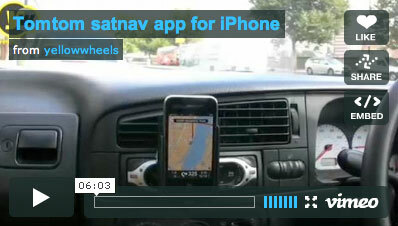 Tomtom satnav app for iPhone from yellowwheels on Vimeo. Starting just after the Tate Museum, we navigated (!) to NAVIGATE TO>POINT OF INTEREST>POI IN CITY>LONDON>MUSEUM/ART GALLERY>MUSEUM OF MOVING IMAGE to the Museum of the moving image, which seemed appropriate. Not a long distance but some challenging roads and one way systems for a satnav to conquer. Our drive east along Millbank, over Lambeth Bridge, turning left onto Lambeth Palace Rd went smoothly, however road works at the south end of Westminster Bridge Rd stopped us following the Tomtom’s instructions. In fact, the 2d map showed us where we needed to go, but the instructions were confusing because the app thought we were on a parallel rd and recalculated. It’s likely that we momentarily were hidden from satellites by tall office blocks. We correctly ended up on York Rd but then it all went wrong. Human error swung in, and we misinterpreted the instruction to turn first left at the giant, IMAX cinema dominated roundabout, and crossed Waterloo bridge. You need to cross a dedicated bus lane and dive down the identically named Waterloo Road, just before the main Waterloo Road; confusing. Belvedere Rd, our destination, lay 30 feet beneath us, and we were forced to negotiate a long loop around the Aldwych and back over the bridge. Fortunately the app recalculated our route speedily, something the Google Maps app and it’s suedo-satnav function, that is standard on iPhone cannot do on the fly. Later on the way home we lost GPS reception through the Aldwych tunnel, but the signal returned impressively quickly. We parked and walked to a shop and found it useful to guide us all the way to our destination on foot. Normally you’d leave your satnav in the car. Phone calls interrupt Tomtom, although app resumes smoothly after call. BTW the holder shown in the video is a custom built holder but uses a standard Griffen charger. There’s a hook behind that you thread through any car vent. I’ve always been a sat nav pessimist, but that looks like a system well worth the money. Given that it’s version 1.0, do you know if there are any upgrades included in the initial download price, or whether they will all be chargeable?